We are able to offer a range of centrifugal extractors, separators and centrifugal filters for solid-liquid, liquid-liquid and liquid-liquid-solid separations. 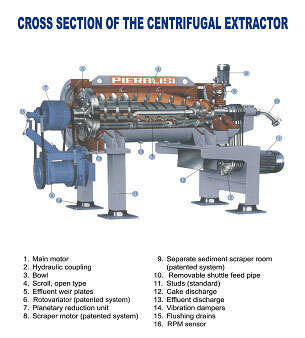 Exact Dewatering Solutions Ltd are the UK distributor for Pieralisi Benelux BV, the environmental division for the Pieralisi group of companies who have in excess of 38,000 centrifugal machines and plant installations throughout the world in many fields in both process and effluent treatment applications. Pieralisi Benelux has attained a major market share in the environmental sector with its decanter centrifuges for the processing of waste water in the food, chemical and the meat processing industry. By applying decanter centrifuges to dewater sludge and separate waste water flows, substantial savings can be achieved based on waste water emission reduction and reduction in volume of the solids.